Representing Australia between 1985 and 1994, Merv gave every ounce of effort to his country, and helped it to re-climb the ranks of Test cricket. Born in Euroa, Victoria, Merv’s school teachers described his enthusiasm for sport as “unquenchable”. It’s this hunger for sport which lead Merv along the path of professional cricket and in 1978-79 saw him playing district cricket with Footscray-Edgewater. The club subsequently named their main home ground after him; the Mervyn G. Hughes Oval. Merv was selected for Victoria in 1981–82, and made his first appearance for Australia against India in 1985–1986. During his international career Merv played in 53 Test matches, taking 212 wickets. He played 33 One Day Internationals, taking 38 wickets. He took a hat trick in a Test against the West Indies at the WACA in 1988–89, and went on to take 8-87. In 1993, Merv saved his greatest series performance for the 1993 Ashes tour, when bowling partner Craig McDermott was ruled out with a twisted bowel. Over the six Tests, Merv took 31 wickets from almost 300 overs, helping Australia to a 4-1 victory over England. He was a useful lower-order batsman, scoring two half-centuries in tests, and over 1000 runs in all. As well as playing for his country, Merv also represented the Victorian Bushrangers, Essex in English county cricket and Australian Capital Territory. Following a serious knee injury sustained during the 1993 Ashes tour, Merv made only a fleeting Test comeback the following summer, finishing with 212 career wickets. However, his enthusiasm for the game continued long after his international days. He appeared for the Canberra Comets during their experiment against the states in domestic one-day cricket, and became a veteran of his local club Footscray, the same club that set him on his journey to professional cricket 20 years earlier. Merv made the step into high-level administration when he replaced Allan Border as an Australian selector from 2005-2010. Dressed in a suit and with contemporary glasses he looked anything but the man who mixed jest with aggression as one of the country’s most recognisable players. He continues to be involved in cricket at both an elite level- as bowling coach of the Melbourne Renegades, and junior level- as a coach at Shaun Brown’s Coaching Clinics. 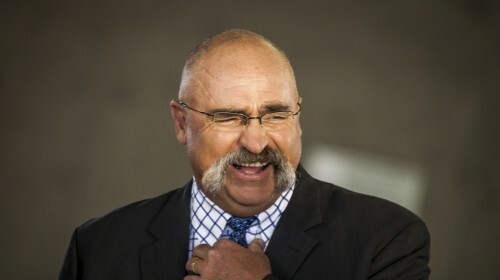 Merv also co-hosts cricket radio show ‘Stumps’ heard across Australia for Crocmedia, as well as appearing regularly on Fox Sports ‘Inside Cricket’ and ‘The Back Page’ programs. 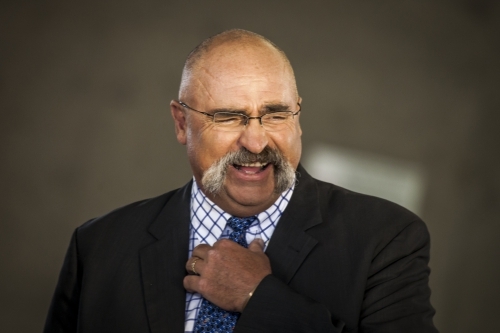 Aside from being one of Australia’s most recognisable and loved cricket identities, Merv also has an enormous passion for fishing. Its this passion that saw Merv release his first book in 2006, ‘Caught in the Deep’. By his own admission, Merv is a long way short of being an expert angler, but as Merv explains with his mixture of humour, anecdotes and a little input from some of Merv’s more experienced fisho mates, you don’t have to be a pro to enjoy fishing. All you need is a sense of adventure, a love of the outdoors and a willingness to learn from those who know! In 2015 Merv will extend his love of fishing to TV, in a new fishing show he will be co-hosting on ONE. Merv enjoys successful partnerships with Diadora, Australian Sports Tours, Grunt & Carlton Mid Strength Beer.